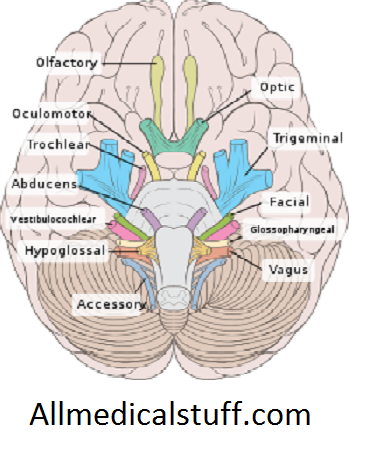 Cranial nerves are those nerves that either arise from brain or brain stem (in pairs). They enervates different organs in head and neck region (with the exception of vagus nerve). These 12 cranial nerves carry different fiberes. Most of them are sensory fibers but some are motor and other are mixed as well. Out of these 12 pairs of cranial nerves, 2 arise from cerebrum while the other from brain stem. These nerves are termed according to their structure or functions. Like optic nerve supply the eye and olfactory is related with smell. 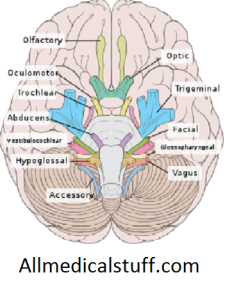 Learn the names of these cranial nerves easily with these mnemonics. As the name suggests, this nerve is related with the sense of smell. Its receptors lie in the mucosa of nasal cavity (in upper part) and sensory (afferent) fibers travel to olfactory bulb after passing various opening in cribriform plate. This is the shortest nerve and doesn’t enters brain stem. As the name suggests, This nerve is related to vision and arise from retina and transmits visual signals to brain. This nerve is considered the part of peripheral nervous system but technically it is the part of central nervous system as it is derived from out pouching of diencephalan and it myelin is produced by oligodendrosites rather then schawann cells. Damage or lesion of this nerve causes completely loss of vision as this nerve carries the visual signals to optic chiasm and then to lateral geniculate nucleus, pretectal nuclei, and superior colliculus as optic tract. Third cranial nerve is called oculomotor nerve. This nerve arise from basal plate infront of superior colliculus in mid brain. Its fibers pass through red nucleus and then via substantia nigra and exit through interpeduncular fossa. It then transverses the cavernous sinus and enter the orbit. Here it divides to superior and inferior branches. Trochlear nerve or fourth cranial nerve is the only cranial nerve that arise from dorsal aspect of mid brain below inferior colliculus. This nerve has the smallest axons as compered to all other cranial nerves but has greatest intracranial length. This nerve carries motor/efferent fibers as it innervates superior oblique muscle. It joins oculomoter, abducens and first two branches of trigeminal nerve in the lateral wall of cavernous sinus. Via superior orbit fissure, trochlear nerve enter the orbit and innervates superior oblique muscle. Nuclei of trigeminal nerve lies in the pones, from where sensory root arises and makes trigeminal ganglion in meckel’s cave. Here all the cell bodies of sensory fibers lies. These give sensory branches to ophthalmic, maxillary and mandibular branches. A motor nerves also arise from motor nuclei in pons and supplies to mandibular branch. The 6th cranial nerve arise medial to facial nerve at the junction of pons and medulla. This nerve has efferent fibers and supplies lateral rectus muscle. Facial nerve supplies the muscles of face and that’s why it is called facial nerve. It has also sensory fibers for facial and taste sensations. It also has parasympathetic fibers that supplies various glands etc. Facial nerve emerges between medulla and pons laterally to abducens nerve. This nerve arise in the junction between pons and medulla lateral to facial nerve. This is concerned with hearing and balance of the body. It has 2 divisions i.e cochlear and vestibular. Cochlear nerve is concerned with hearing and vestublar nerve is concerned with balance of the body. Damage to this nerve may cause loss of hearing, sense of motion and loss of equilibrium etc. This is a mixed type of nerve that has both the sensory and motor fibers and parasympathetic as well. This nerve has many functions as it supplies many different organs. It has various sensory and motor functions. Sensory functions include taste, sensations of oropharynx and tonsil etc. Motor function includes contraction of stylopharyngeus muscle that shortens and widens pharynx and elevates larynx. Vagus nerve arise from its four nuclei that are situated in medulla. It then descends down into the neck and abdomen by passing via the jugular foreman. Unlike other cranial nerves, vagus nerve innervate many organs in the thorax and abdomen and that’s why it was used to by called pneumogastric nerve. It has both afferent and efferent fibers but most of them are afferent fibers that carry sensory information from different organs. It has also parasympathetic effect on many organs like heart and GIT etc. It supplies parasympathetic branches to many organs and control some skeletal muscles as well like: superior, middle and inferior pharyngeal constrictors, Levator veli palatini, Palatoglossus muscle, Cricothyroid muscle etc. Accessory nerve or eleventh cranial nerve is another cranial nerve which has an exception to other cranial nerves. Unlike other cranial nerves, this nerve has two parts: Cranial part that arises from medulla and spinal part that arises from cervical part. The spinal part ascends via a foramen and joins cranial part to make accessory nerve. Accessory nerve has only motor fibers and innervates sternocleidomastoid muscle and trapezius muscle. As the name indicates, this nerve is related to tongue. This nerve passes below tongue as the name suggests “hypo” means “below” and “glossal” means tongue. This nerve supplies motor (efferent) fibers to all the muscles of tongue except one that is : palatoglossus muscle which is supplied by the 10th cranial nerve i.e vagus nerve. All the 12 pairs of cranial nerves arise from brain and brain stem except the spinal part of accessory nerve. They supplies all the sensory and motor fibers to different muscles and other organs in head and neck and one them i.e vagus nerve supplies the lower organs as well. U r just.. Amajing.. I shared ur site with lot of people… Thnquuuu keep that up..
i am glad that you like my site…keep visiting. Thanks for the information, it really helped a lot .